When most people think of Vancouver Island images of flower-filled gardens, tea at the Empress and harried politicians quickly spring to mind. But the quaint charm of BC's capital city Victoria is only the tip of the iceberg of what Vancouver Island has to offer and for the backcountry skier it's a paradise of deep snowpacks, quiet, remote ridge lines and some surprisingly huge drops. The Island Alps have their southern end about a third of the way 'up-island' near Port Alberni and the isolated peak of Mt Arrowsmith. From here the range runs north in a maze of deep valleys and steep peaks through Strathcona Park, the heart of Island mountaineering, and on past the Sutton Range home of the Island's lift-area gem Mt Cain, and the legendary spires of the Rugged Range. The Island Alps rise straight out of the Pacific Ocean, to over 2000m, peaking at the Island's highest summit the Golden Hinde at 2,197m (7,208 ft). This relief from ocean shore to mountain top puts the range in a class with any other alpine region. 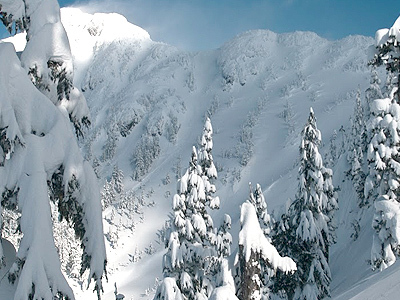 Ski touring on Vancouver Island is like no other place in BC. There's no extensive glaciers here or hut to hut routes. The terrain is rugged, complex and incredibly beautiful. The rain that the west coast is famous for falls in the Island alpine as one of the world's deepest annual snowpacks. Winter snowfalls of 7, 8, 9 or more meters are not uncommon. Temperatures are typically mild with -5˚ being a cold day. And the secret of Island skiers is that so often the grey clouds blanketing the lowlands are far below the alpine ridges which is where the west coast winter sun is found. Across BC skiers and boarders pay tribute to Ullr - adopted god of the snows. If you want to visit Ullr's home, where the snow falls deeper than anywhere then head west to the end of the road. Get to the col between the west and north bowls from a short, steep boot pack above the upper T-bar or just below it on the west side by ducking the ski area boundary rope (be sure you understand the risk and liability implications of leaving the Mt Cain ski area boundary). From a high point on the ridge above the T station (L4) descend the central gully which is the least steep and most supported line into the West Bowl. 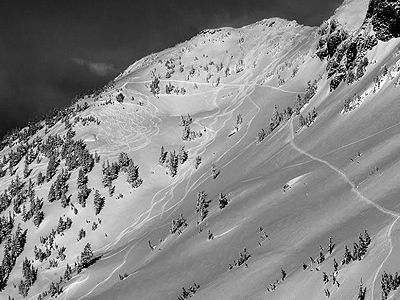 Options also exist on the skiers right from the base of the gully in the west/southwest facing “doors” and to the skiers left in the north west facing “Sliders” by making a long traverse under the West Bowl/North Bowl col. Entrance from west ridge at 1,560m entails exposure to avalanche terrain that is often wind loaded. Entrance from the “Golf Club" via the north west ridge involves brief exposure to a start zone. “The Doors” and “Sliders” are both avalanche paths. If choosing to enter from the west ridge at 1565m, instead of a straight traverse, pick a line that limits undercutting of loaded slopes above to the extent that this is possible by descending about 80 vertical metres from the entrance before traversing to below the col. Consider entering via the “Golf Club” about 50 vertical metres above the top lift station and descending the NW ridge to the col at 1560m. If choosing to ski “the doors” be aware of wind slab which often forms along the base of the cliffs at ridge line above you. Don’t traverse in too high. Sliders is the least safe feature of the three as it is steep, convex and often wind loaded over thin snow pack. Some parties choose to enter via avalanche start zones off the NW ridge. These are only suitable in times of low hazard. After your 580 metre descent return to Mount Cain Ski Resort from the base of West Bowl skin Southeast and gently climb up through the trees back to the ridge. After 10 - 15 minutes of walking you will pop back out on the lower part of Ridge Run. 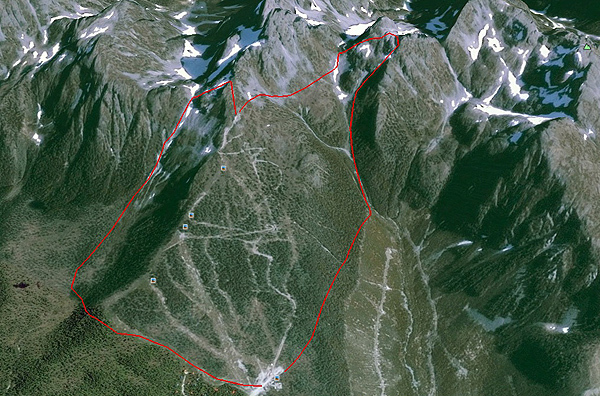 ACCESS: Mount Cain, 100m or 250m down the trail Ridge Run from the top of the T-bar. Entrance past ski area boundary on east side on east boundary adjacent to top lift station. Ski directly into bowl or traverse into bowl for a number of options for descent all of which lead into the central gully. Make a long traverse on the prominent shelf below the south face of Mt Cain to reach the ascent up to the top of the Dream Chute. Entering the upper bowl and traversing it results in immediate and relentless exposure to bottoms of start zones or tops in tracks. Mid to lower run entails exposure to multiple overlapping tracks and run outs. Ascending to Dream Chute avoid slabs and convexities either by a direct ascent on foot near the north west ridge above the col between Cain and the unnamed peak between Mt Cain and Mt Abel or by working a line between convexities on the right of the face. The Dream Chute descends 750 metres off the northwest aspect of the unnamed peak in a steep drop and joined the main East Bowl Gully near the traverse line back to the ski area base. Once at the bottom you will be in a gully and ultimately see a clear cut, look for some old flagging tape on your right which is the route back to the ski resort. Keep a constant elevation and you will shortly be back at Mount Cain Ski Resort. ACCESS: Mount Cain, from the top of the T-bar head East 100m to the ski area boundary..
Castlecrag is a small but jagged summit, south-east of Mt. Albert Edward, overlooking Moat Lake. The Castlecrag Circuit is a superb, easily accessed ski tour around the height of land encircling Moat Lake. It can be undertaken in either direction and takes in some of the most dramatic terrain in this region of Strathcona Park including an easy side trip to the summit of Mt Albert Edward. From the parking lot at Mt. Washington's Raven Lodge, head south-west either on the groomed cross-country track with a pass, or off-piste 'sans billet', following the Paradise Meadows trail up to Lake Helen Mackenzie. If conditions allow cross the lake directly, aiming for the low pass between Mt. Brooks and Mt. Elma, if the lake is too thawed or otherwise impassable follow the trail counterclockwise around the north and west shores of the lake and gain the Brooks-Elma Pass. From the Brooks-Elma pass continue along the general route of the trail, past the Park's hut south-west to Hairtrigger and Kwai lakes and on to the low saddle between Moat and Circlet lakes. Here you decide which direction to complete the Castlecrag Circuit. If you plan to spend the night out Circlet Lake is the best place to plan a camp. The recommended direction to complete the Castlecrag Circuit is clockwise, so from the pass between the lakes descend due south to the outlet of Moat Lake. Follow the shore of Moat Lake south and continue straight up onto the shoulder of the north-west ridge of Castlecrag. There is some short ski terrain from here back to Moat Lake. To continue higher up choose a safe line near the 1400m contour and make a long traverse across the east flank of Castlecrag to the open slopes on its south side. Switchback up the south face to take in the summit of Castlecrag. If time allows take advantage of some of the short but sweet ski lines on this face of the mountain down into the timbered slopes below. Cross the south face from below the summit to the col between Castlecrag and Mt. Frink then ascend Frink's east ridge to its top. A few short turns lead down onto the wide open terrain of Mt. Albert Edward's east ridge. If plans permit, make the long steady climb up to the summit of Mt. Albert Edward. On fast snow you'll enjoy some nice carves off Albert Edward retracing your line back down the east ridge. Swing north-east following the natural height of land toward the col with Jutland Mountain. Fit parties or those with more time may want to continue along the ridge to Jutland Mountain and descend some of the steeper terrain down to Circlet Lake. More directly follow the summer route to Mt. Albert Edward and descend due east down the steep ridge between Circlet Lake and Moat Lake. Continue down to Circlet Lake to camp or return along the Paradise Meadows trail to the parking lot. ACCESS: Mt. Washington Resort, take the Paradise Meadows trail, via Lake Helen Mackenzie, to the ridge between Circlet and Moat lakes. 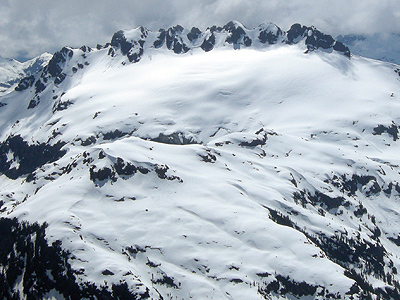 Submitted by: Phil, author of: "Island Turns and Tours"
Big Interior Mountain and Nine Peaks have some of the best descent terrain of the southern Strathcona Mountains combined with quick access via the Bedwell trail. As a result these peaks are some of the more popular ski touring destinations on the Island. 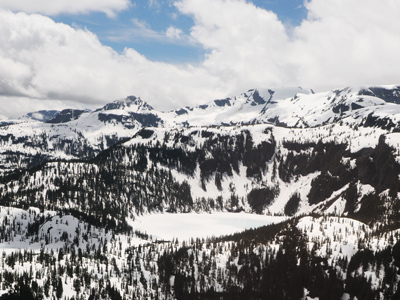 north-east cirque can be skied out down to the meadows to Bedwell Lake, no need to follow the standard summer line. The cirque between the Big Interior summit and Marjorie's Load looks very promising right down to the small tarn at its base. And heading toward Nine Peaks the ridge past Marjorie's Load down to You Pass will go quickly on skis. Take care to avoid exposure on the slopes above Della Lake, there is a steep cliff below the bench on the east side of the ridge dropping into the cirque. On Nine Peaks the glacier can be skied right off the summit 700+m down to Beauty Lake. Keep to the north side of the glacier trending to skiers left, or just head more northward and drop right back down to You Pass and on down to Della Lake. Skiing from the Bedwell trailhead out and back to Nine Peaks over Big Interior is a classic Island tour and passes through some great ski terrain. Start up the Bedwell Trail to the campsite at Bedwell Lake. From here either take the route to Cream Lake south-eastward up to the Bedwell-Drinkwater Pass and traverse across the summer route into the base of the main north cirque, or try a more direct approach by leaving the Cream Lake route much lower than the pass and traverse into a meadow below Big Interior's north-east cirque. Follow the creek draining the cirque right up to a headwall where it takes a steep sided gully through the wall. If conditions are right the gully may be ascended directly otherwise look on either side of the headwall for a safe line into the cirque base. However you reach it the base of this cirque makes an excellent campsite. To get higher on the peak and to continue on to Nine Peaks head directly up the snout of the glacier heading south toward the summit, traverse under the north side of the North-East Summit to less exposed ground on the south-east side of the ridge. The ridge up to the summit becomes gradually more exposed but in good conditions you can ski right to and off the summit.The approach up the Bedwell trail to Bedwell Lake and on to the Drinkwater-Bedwell Pass is essentially hazard free and if conditions aren't favourable for your planned destination there's always the consolation of continuing over to Cream Lake, keeping on more moderate ground. ACCESS: Buttle Lake via the Bedwell Trail off the Jim Mitchell Lake Rd. Access varies with snow cover, whether or not the road is plowed or snow free and the gate being open which it typically is. Submitted by: Phil, author of : "Island Turns and Tours"